'The Bronte Sisters' (NPG 1725), also known as the "Pillar portrait,' was painted by their brother Branwell in the 1830s. Left to right is Anne, Emily and Charlotte; Branwell is the painted out figure in the pillar of light, just visible. The painting was at Haworth Parsonage until 1861 when Charlotte's widower, Arthur Bell Nicholls, took it with him to Ireland. It remained hidden for over five decades and was thought lost until it was 'discovered' by Mr Nicholls' widow in 1913. This is the only surviving group portrait of the sisters. Branwell painted two group portraits of his sisters. The contemporary comments on these, known as the 'Pillar' and 'Gun' group portraits agree that they were "poorly executed" but there was no criticism of the resemblances which were considered by the family to be good. The people commenting on the portraits were visiting the sisters' father, the Rev Patrick Bronte so it is assumed that this was his opinion. Comments on Branwell's portraits depicting people outside the family circle are much the same. If the photo does depict the Bronte sisters then it can only be a copy of an 1840s daguerreotype. The original photo would have been a reversed image viewed as below with Charlotte on the right.1. Above left: 'The Bronte Sisters' (NPG 1725) painted in the 1830s. Above right: 'The Bronte Sisters Photo' (reversed). Branwell's 'Pillar' portrait as originally envisaged used a more balanced triangular composition and he would have stood over his seated sisters. His ghostly figure can just be made out in the centre (the pillar), where he painted himself out before his own portrait was completed. He was actually shorter than Emily so this would have conveniently exaggerated his height, allowing him to form the apex of the implied triangle. 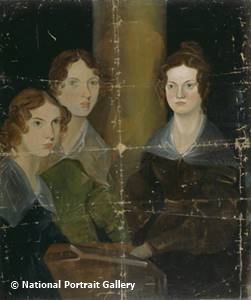 Close examination of Branwell's portrait reveals that the three sisters have three different nose shapes: Anne = convex, Emily = straight, Charlotte = possibly concave and this is the same for the respective 'sisters' in the photograph. The photograph corrects the deficiency in the Pillar Portrait by placing Emily at the apex but the fact that there was a figure behind the pillar in the painting and that the composition should have been triangular was not known about until the 1950s. 2. 1. A daguerreotype was almost always a reversed image. Being a mirror image, any visible text such as a shop sign, would appear back to front. The same was true for most collodion photos of the 1850s because they were usually placed in a frame with the collodion image-side facing the viewer. This is explained in "Is the photo an 1850s copy?" 2. When the painting was purchased by the NPG in 1914 the figure behind the pillar was not discernable but it has become clearer over time. It was first noticed in the 1950s and confirmed soon after when the painting was x-rayed by the NPG.